The Sony RX100 IV looks almost identical to the Sony RX100 III on the outside. The only thing that has changed on the hardware side is an increase in the resolution of the pop-up viewfinder. You can find many improvements internally, though, like a bump up from HD to 4K video recording, slo-mo video a more responsive autofocus system and faster continuous shooting for both RAW and JPEG. These tips and tricks for the RX100 IV are mainly useful for photographers, although I have included some tips for the casual video shooter too. You should make sure you are running firmware version 2.0, released in 2017. The original Sony RX100: You can find them here. The Sony RX100 III here. Since the Sony RX100 IV has the same menu layout as recently released Sony Alpha cameras, you’ll quickly find your way around if you already own one of those. I’ll be going over the entire Menu structure in this post, and giving you tips, pointers, and tricks along the way. If you’re a bit impatient, there is a more abbreviated “best settings” chapter before my conclusion. When you switch on your camera, you’ll be asked to enter a date, time and timezone. This setting is necessary, as all images captured will have a timestamp, making it easy to find your favorite pictures in the future. After this is setup, press the MENU button. You’ll see a range of icons and pages. The larger the image size, the more detail will be reproduced when the image is printed on large-format paper. The smaller the image size, the more images can be recorded. 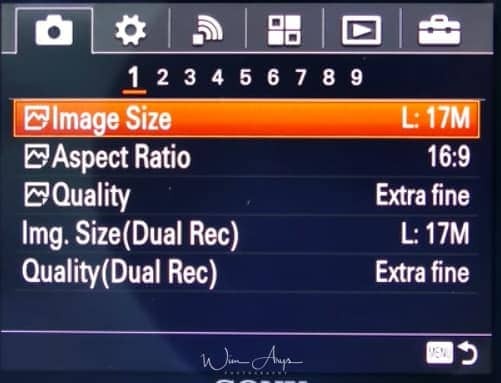 Note that when Quality is set to RAW or RAW & JPEG, the image size for RAW images is automatically set to L for optimal quality. If SD card space is an issue, you can set it to Small. You can choose 3:2 (which uses the full sensor surface), 4:3, 1:1 or 16:9 (crop but a more broad view). Leave as is at 3:2, you can always crop your pictures later. Selects the size of still images to be shot while recording movies. Only Jpeg. Selects the quality of still images to be shot while recording movies. Only Jpeg. MP4: Records mp4 (AVC) movies. This format is suitable for playback on smartphones or tablets, web uploads, email attachments, etc. Audio: AAC. You can choose the quality of recorded video here. You can change the image size, frame rate, and image quality for movie recording. The higher the bitrate, the higher the image quality. If you’re not familiar with this, leave as is. 60i/50i: Movies are recorded at approximately 60 fields/sec (for 1080 60i-compatible devices) or 50 fields/sec (for 1080 50i-compatible devices), in interlaced mode, with Dolby Digital audio, in AVCHD format. 24p/25p: Movies are recorded at approximately 24 frames/sec (for 1080 60i-compatible devices) or 25 frames/sec (for 1080 50i-compatible devices), in progressive mode, with Dolby Digital audio, in AVCHD format. 60p/50p: Movies are recorded at approximately 60 frames/sec (for 1080 60i-compatible devices) or 50 frames/sec (for 1080 50i-compatible devices), in progressive mode, with Dolby Digital audio, in AVCHD format. Movies shot are recorded in MPEG-4 format, at approximately 60 frames/sec (for 1080 60icompatible devices), approximately 50 frames/sec (for 1080 50i-compatible devices), approximately 30 frames/sec (for 1080 60i-compatible devices) or approximately 25 frames/sec (for 1080 50i-compatible devices), in progressive mode, with AAC audio, MP4 format. 60p/50p movies can be played back only on compatible devices. Movies recorded with the [60p 28M(PS)]/[50p 28M(PS)]/[60i 24M(FX)]/[50i 24M(FX)]/ [24p 24M(FX)] /[25p 24M(FX)] setting in [ Record Setting] are converted by PlayMemories Home in order to create an AVCHD recording disc. This conversion can take a long time. Also, you cannot create a disc in the original image quality. If you want to keep the original image quality, store your movies on a Blu-ray Disc. To play back 24p/25p movies on a TV, the TV must be compatible with the 24p/25p formats. If the TV is not compatible with the 24p/25p format, 24p/25p movies will be output as 60i/50i movies. You cannot create discs with movies recorded with [XAVC S] or [MP4] recording settings using PlayMemories Home. Allows you to simultaneously record an XAVC S movie and an MP4 movie, or an AVCHD movie and an MP4 movie. On or Off. By shooting with a higher frame rate than the recording format, you can record a smooth super-slow-motion movie. Set the mode dial to High Frame Rate. The HFR setting screen will be displayed. 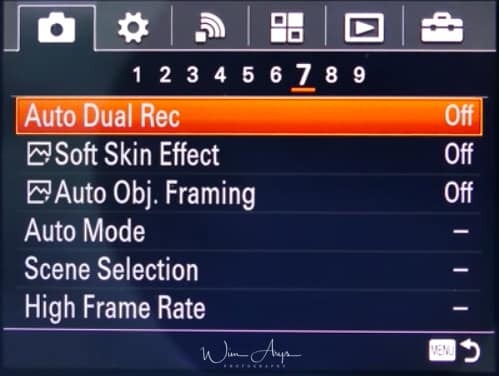 Select MENU→ Camera Settings→HFR Settings and select the desired settings for Record Setting, Frame Rate, Priority Setting, and REC Timing. You can adjust the desired exposure mode by selecting MENU→ camera Settings→High Frame Rate. You can set other shooting settings such as focus area, focus mode, and frame rate, and perform zooming on the HFR setting screen. Press the in the center of the control wheel. The HFR shooting screen will be displayed. To change the settings, press in the center once again to switch to the HFR setting screen. HFR Record Setting: Selects the frame rate of the movie from 60p 50M/50p 50M, 30p 50M/25p 50M, and 24p 50M. HFR Frame Rate: Selects the shooting frame rate from 240fps/250fps, 480fps/500fps, and 960fps/1000fps. FFR Priority Setting: Select Quality Priority or Shoot Time Priority. If you select Shoot Time Priority, the recordable duration is longer than in Quality Priority mode. HFR REC Timing: Selects whether to record a set amount of time after pressing the MOVIE button (Start Trigger), or to record for a set amount of time until you press the MOVIE button (End Trigger). (Only available when in panorama shooting mode) Size is selectable between standard and wide. Wide means your picture will cover a larger area. Set it to standard, having to scan an even broader area when making panoramas will take some experience with the camera to do efficiently. Size is selectable between standard and wide. Wide means your picture will cover a larger area. Set it to standard, having to scan an even broader area when making panoramas will take some experience with the camera to do efficiently. Set it to standard, having to scan an even broader area when making panoramas will take some experience with the camera to do efficiently. 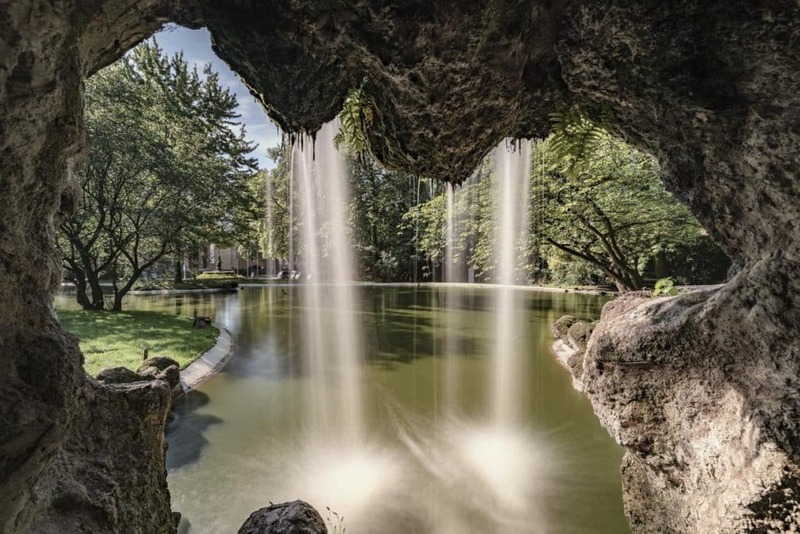 A panorama picture (only available in jpeg) is a composite of several images stitched together. When in this mode, you’ll see an arrow that guides you in what direction and speed you should pan the camera to take the sequential images that will be stitched together. You can choose the path in this menu (either, up, down, left or right). You can make panoramas while scanning your camera up-down or left-right.So what is this all about? This might sound confusing at first, but this comes down to how you hold the Sony RX100 IV when shooting panoramas: either in portrait or landscape orientation. You can set the drive mode, such as continuous or self-timer shooting. Single Shooting (default setting): Shoots one still image. Normal shooting mode. Self-timer: Shoots an image after 10 or 2 seconds. 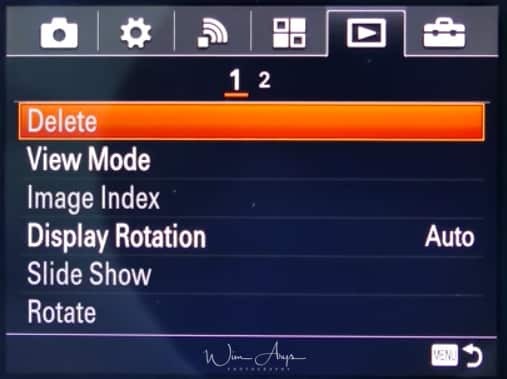 (selectable in sub menu) You can change the angle of the LCD screen and shoot images while monitoring the image on the screen. Self-timer(Cont): Shoots a specified number of images continuously after 10 seconds or 2 seconds (selectable in the sub menu). Cont. Bracket: Shoots images while holding the shutter button down, each with different degrees of brightness. (from 3 to 5 images with between .3 and 3 EV difference, selectable in the sub menu.) For processing as HDR on your PC. Single Bracket: Shoots a specified number of images, one by one, each with a different degree of brightness. (from 3 to 5 images with between .3 and 3 EV difference, selectable in the sub menu) For processing as HDR on your PC. DRO Bracket: Shoots a total of three images, each at a different degree of D-Range Optimizer. You can set the shooting order for exposure bracketing and white balance bracketing here. Turn the flash off, even when it is popped up. The flash works in dark environments or when shooting towards a bright light. The flash works every time you trigger the shutter. Tells the camera to use a longer shutter speed along with a flash, and thus is better for night shots. In manual and shutter priority modes, there is no difference in flash power. But when using aperture priority, program, or auto, choosing slow sync tells the camera to use a longer shutter speed than it would ordinarily pick.What the slow sync flash mode actual does is first fire the flash for the subject exposure, then allow for a longer shutter speed that will allow for more ambient light to be captured by the sensor. Especially when using Slow Sync or Rear Sync Flash modes, you might have to lower the power of the Flash to get a decently exposed image. This anti-Red Eye setting quickly fires the flash before your image capture starts, reducing the red-eye effect often seen when using a flash. With a half-press of the shutter button, the camera will focus only once. Suitable for capturing stills. The camera will continuously focus on any movement when you half-press the shutter button. The RX100 Mark 3 focuses on your subject and allows you to fine tune your focus area further using the manual focus ring on the lens. When focussing manually or in DMF mode, you can set the camera to magnify a part of the screen so you can check focus. This sub-menu allows you to select the part of the image that will be magnified during shooting. No autofocus is used, and you focus manually using the focus ring on the lens. You might think it is best to leave it on the factory ‘wide’ setting (as this uses all AF points), but for certain scenes, it is often better to use a zone or flexible spot to get it to focus on what you want. Wide focus area uses all focus points on the sensor. Ideal for action scenes where there is a lot of movement going on in your frame. Focusses on whatever is centered in your images. A fail-proof way of getting the camera to focus on what you want. 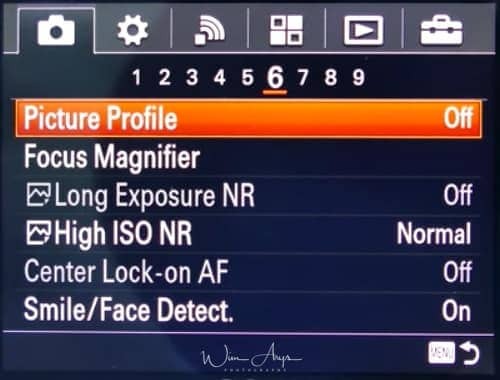 If you have any problems using the autofocus and are in a situation where you don’t want to miss any shots, revert to Center and just make sure you have your subject centered. If the Sony RX100 IV fails to focus on the single selected point, it uses the focus points around the flexible spot as the second priority area to achieve focus. When the shutter button is pressed and held halfway down, the RX100M3 tracks the subject within the selected autofocus area. 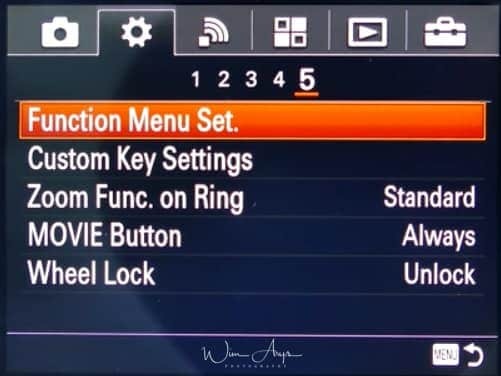 Point the cursor to Lock-on AF on the Focus Area setting screen, then select the desired tracking start area using the left/right sides of the control wheel. You can move the tracking start area to a desired point by designating the area to be the flexible spot or expand flexible spot. On the Flexible Spot shooting screen, you can change the size of the AF range finder frame by rotating the control wheel. The AF illuminator is a little red light allowing the camera to focus more easily when the shutter button is pressed halfway. It automatically is switched off when you fully press the shutter. Leave it on. If you find that your image is overexposed (for instance when you are shooting at large apertures for a shallow depth-of-field in bright daylight), you can tweak the exposure compensation here in a plus or minus 5 (exact EV dependent on next step) range. I have this range set between 100-1600 as this range is virtually noise free, and I don’t like the ISO performance above 3200. If you’re a jpeg shooter (and use built-in Noise Reduction), you might think of using a higher top value (factory setting goes up to 12800). Probably one of the most powerful new features, you can now select when the camera will go to a higher ISO in order to get an appropriate shutter speed. Great for shooting moving subjects. 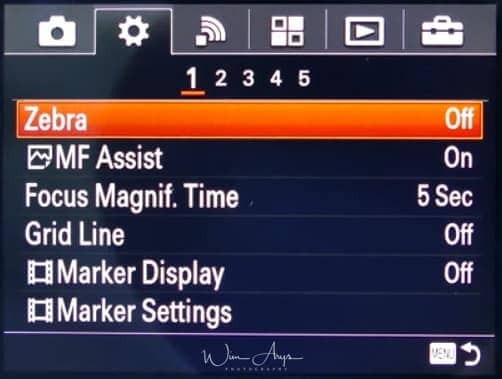 If you select ISO AUTO under Multi Frame NR when the shooting mode is P (Program Auto) or A (Aperture Priority), you can set the shutter speed at which the ISO sensitivity starts changing. FASTER (Faster)/FAST (Fast): The ISO sensitivity will start to change at shutter speeds faster than [Standard], so you can prevent camera shake and subject blurring. STD (Standard): The camera automatically sets the shutter speed based on the focal length of the lens. SLOW (Slow)/SLOWER (Slower): The ISO sensitivity will start to change at shutter speeds slower than [Standard], so you can shoot images with less noise. 1/32000―30″: The ISO sensitivity starts to change at the shutter speed you have set. From the Mark 3 onwards, the Sony comes with a built-in 3 stop ND filter. If you use an ND filter, the amount of light entering the camera is reduced. You can slow down the shutter speed and decrease the aperture value for a better exposure. Auto (default setting): Automatically turns on the ND filter based on the shooting mode and brightness. On: Always uses built-in ND Filter. Off: Disables the ND Filter function. Metering mode refers to the way the camera reads the light and sets the exposure. In multi, it considers the whole frame and sets exposure according to internal algorithms programmed in camera. In spot or center, the camera only considers what is in that spot or the center (per example, if your subject is completely black, the camera will try to compensate by overexposing the image). Auto (default setting): The product automatically detects the light source and adjusts the color tones. Daylight: The color tones are adjusted for the daylight. Shade: The color tones are adjusted for shadiness. Cloudy: The color temperature is adjusted for a cloudy sky. Incandescent: The color temperature is adjusted for places under an incandescent lamp, or under bright lightings, such as in a photo studio. Fluor. : Warm White: The color temperature is adjusted for warm white fluorescent lighting. Fluor. : Cool White: The color temperature is adjusted for white fluorescent lighting. Fluor. : Day White: The color temperature is adjusted for neutral white fluorescent lighting. Fluor. : Daylight: The color temperature is adjusted for daylight fluorescent lighting. Flash: The color temperature is adjusted for a flash. Underwater Auto: The color temperature is adjusted for underwater shooting. C.Temp./Filter: Adjusts the color tones depending on the light source. Achieves the effect of CC (Color Compensation) filters for photography. Custom: Uses the white balance setting saved in [Custom Setup]. Custom Setup: Memorizes the basic white color under the light conditions for the shooting environment. Underwater Auto (New in the Sony RX100 IV firmware update 2.0 (2017)) mainly for use with the Sony MPK-URX100A Underwater Housing. This stands for Dynamic range optimize and analyses the contrast of your scene in real-time. It produces an image with optimal brightness and recovered shadow detail. You can use this function even while the subject is moving or during the continuous shooting. D-Range Optimizer: Auto (default setting): Corrects the brightness automatically. (not available for RAW captures) this feature Shoots three images with different exposures and then overlays the bright area of the underexposed image and the dark area of the over exposed image to create a picture with an extended range from highlight to shadow. The highlight detail in auto HDR is better than that in DRO and with reduced noise. The shutter is released three times, so using this function for moving subjects is not recommended. This menu setting allows you to select the desired image processing. You can adjust exposure (shutter speed and aperture) as you like with [Creative Style], unlike with [Scene Selection] where the product adjusts the exposure. Standard (default setting): For shooting various scenes with rich gradation and beautiful colors. Vivid: The saturation and contrast are heightened for shooting striking images of colorful scenes and subjects such as flowers, spring greenery, blue sky, or ocean views. Portrait: For shooting the skin color in a soft tone, ideally suited for shooting portraits. Landscape: The saturation, contrast, and sharpness are heightened for shooting vivid and crisp scenery. Distant landscapes also stand out more. Sunset: For shooting the beautiful red of the setting sun. Black & White: For shooting images in black and white monotone. Sepia: For shooting images in sepia monotone. Contrast, Saturation, and Sharpness can be adjusted for each Creative Style item. Select an item to be set by pressing the right/left side of the control wheel, then set the value using the top/bottom side of the control wheel. Contrast: The higher the value selected, the more the difference of light and shadow is accentuated, and the bigger the effect on the image. Saturation: The higher the value selected, the more vivid the color. When a lower value is selected, the color of the image is restrained and subdued. Sharpness: Adjusts the sharpness. The higher the value selected, the more the contours are accentuated, and the lower the value selected, the more the contours are softened. Think of this menu as an Instagram app right in your camera, with all kinds of retro filters and effects. These are only available when quality is set to Jpeg (Not in RAW). Off (default setting): Disables the Picture Effect function. Toy Camera: Creates a soft image with shaded corners and reduced sharpness. Pop Color: Creates a vivid look by emphasizing color tones. Posterization: Creates a high contrast, abstract look by heavily emphasizing primary colors, or in black and white. Retro Photo: Creates the look of an aged photo with sepia color tones and faded contrast. Soft High-key: Creates an image with the indicated atmosphere: bright, transparent, ethereal, tender, soft. Partial Color: Creates an image which retains a specific color, but converts others to black and white. High Contrast Mono. : Creates a high-contrast image in black and white. Soft Focus: Creates an image filled with a soft lighting effect. HDR Painting: Creates the look of a painting, enhancing the colors and details. Rich-tone Mono. 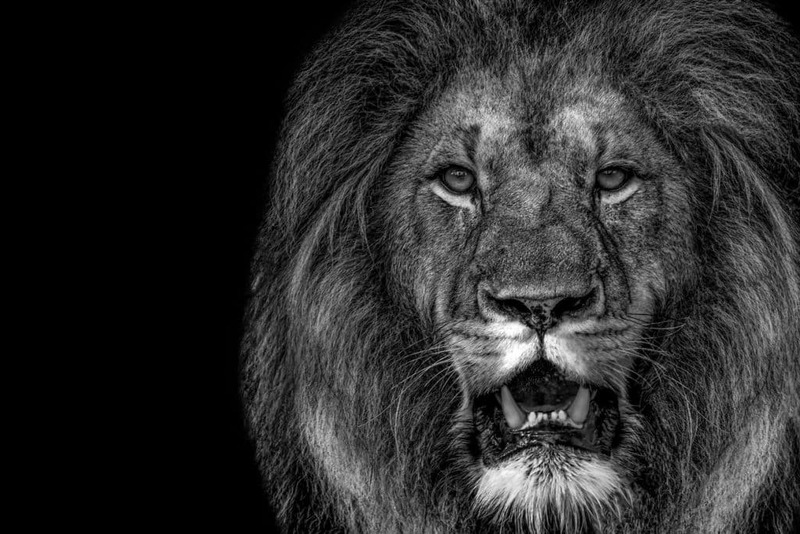 : Creates an image in black and white with rich gradation and reproduction of details. 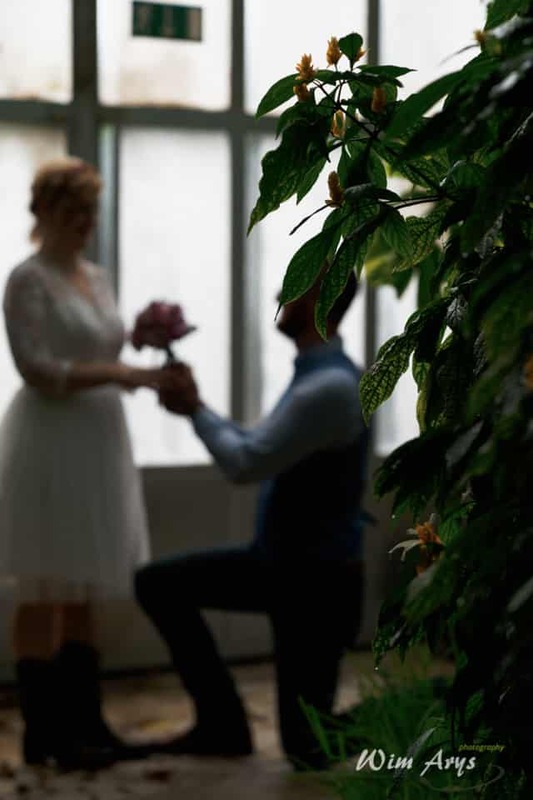 Miniature: Creates an image which enhances the subject vividly, with the background defocused considerably. This effect may often be found in pictures of miniature models. Watercolor: Creates an image with ink bleed and blurring effects as if painted using watercolors. Illustration: Creates an illustration-like image by emphasizing the outlines. Gamma Selects a gamma curve. Movie: Standard gamma curve for movies Still: Standard gamma curve for still images Cine1: Softens the contrast in dark parts and emphasizes gradation in bright parts to produce a relaxed color movie. (equivalent to HG4609G33) Cine2: Similar to [Cine1] but optimized for editing with up to 100% video signal. (equivalent to HG4600G30) ITU709: Gamma curve that corresponds to ITU709. ITU709(800%): Gamma curve for confirming scenes on the assumption of shooting using [SLog2]. S-Log2: Gamma curve for [S-Log2]. This setting is based on the assumption that the picture will be processed after shooting. Color Mode Sets type and level of colors. Movie: Suitable colors when [Gamma] is set to [Movie]. Still: Suitable colors when [Gamma] is set to [Still]. Cinema: Suitable colors when [Gamma] is set to [Cine1]. Pro: Similar color tones to the standard image quality of Sony professional cameras (when combined with ITU709 gamma) ITU709 Matrix: Colors corresponding to ITU709 standard (when combined with ITU709 gamma) Black & White: Sets the saturation to zero for shooting in black and white. S-Gamut: Setting based on the assumption that the pictures will be processed after shooting. Used when [Gamma] is set to [S-Log2]. You can change the magnifier scaling in two steps by pressing in the center, and close the focus magnifier mode and return to the normal shooting display by pressing three times. Yes, finally it’s here for Sony RX100 users, Long exposure Noise Reduction. This kicks in when you set the shutter speed to 1/3 second or longer. Noise reduction is turned on for the duration that the shutter is open. With the function turned on, the grainy noise typical of long exposures is reduced. This is a very powerful autofocus feature. When turned ON, it allows you to track a subject. 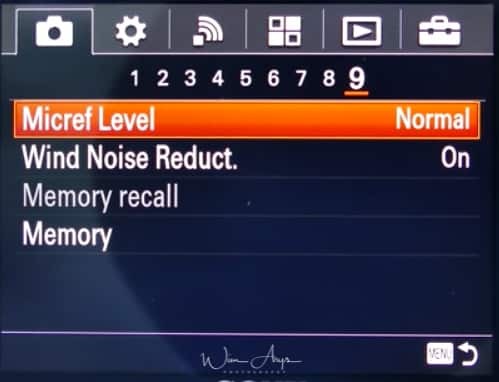 In the iAuto mode, you can access this feature (when turned ON and the camera is set to AF) by pressing the Center button of the multi-controller. You’ll see a square on your screen, then center your desired tracking subject and the camera will continue to track it, even when it exits your frame and reappears. This is another powerful feature. It can be set to automatically detect on focus on (registered) faces and enable a function called Smile Shutter. When the latter is enabled, the camera will automatically capture an image when a smile is detected. Did I hear you say Selfie? Yes, it’s the ultimate selfie tool, along with the pivoting screen. Sets whether or not to automatically shoot still images when shooting movies. Shoots when impressive compositions, including people, are detected. This function may also record versions of the automatically shot images that have been trimmed into optimal compositions. When a trimmed image is recorded, both the image before trimming and the trimmed image will be recorded. When enabled, the Sony RX100 IV will automatically crop your captured image to what it deems best. Meaning it will cut the picture for a nicer composition. Only available for Jpegs, though, a nice feature if you don’t want to bother too much with the technical side of photography. This allows you to shoot with preset settings according to the scene. To change the scene, simply rotate the control wheel on the shooting screen and select a new scene. Portrait: Blurs background and sharpens the subject. Accentuates the skin tones softly. Sports Action: Shoots a moving subject at a fast shutter speed so that the subject looks as if it is standing still. The product shoots images continuously while the shutter button is pressed. Macro: Shoots close-ups of the subjects, such as flowers, insects, food, or small items. Landscape: Shoots the entire range of a scenery in sharp focus with vivid colors. Sunset: Shoots the red of the sunset beautifully. Night Scene: Shoots night scenes without losing the dark atmosphere. Hand-held Twilight: Shoots night scenes with less noise and blur without using a tripod. A burst of shots are taken, and image processing is applied to reduce subject blur, camera shake, and noise. Night Portrait: Shoots night scene portraits using the flash. The flash does not pop-up automatically. Pop-up the flash before shooting. Anti Motion Blur: Allows you to shoot indoor shots without using the flash and reduces subject blur. The product shoots burst images and combines them to create the image, reducing subject blur and noise. Pet: Allows you to shoot images of your pet with the best settings. Gourmet: Allows you to shoot food arrangements in delicious and bright colors. Fireworks: Allows you to shoot images of fireworks in all their splendor. 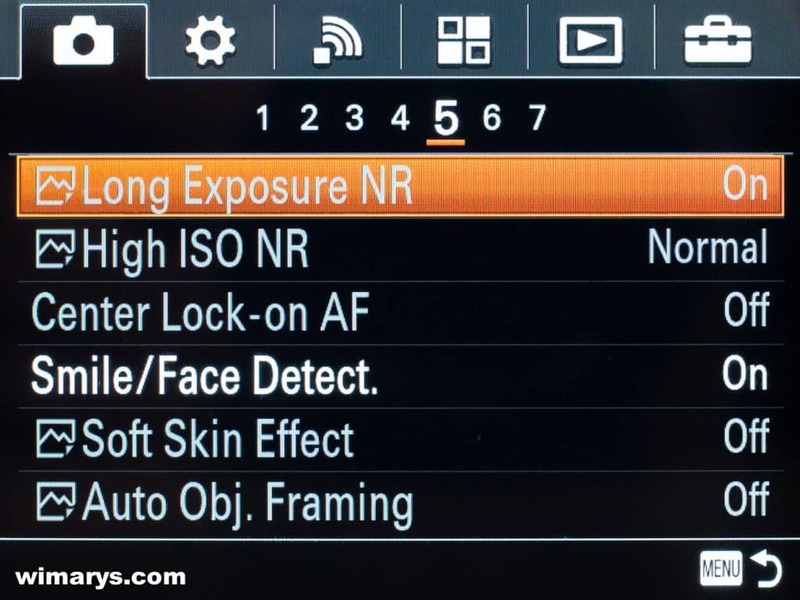 You can select the exposure mode for HFR shooting based on the subject and effect you want. You can adjust the shutter speed or aperture value to your desired settings for recording movies. You can also check the image angle before shooting. Program Auto: Allows you to shoot with the exposure adjusted automatically (both the shutter speed and the aperture value). Aperture Priority: Allows you to shoot after adjusting the aperture value manually. Shutter Priority: Allows you to shoot after adjusting the shutter speed manually. Sets whether or not to use the SteadyShot (also known as image stabilization) function for photography. Steadyshot allows you to take sharp pictures at longer shutter speeds (say on a cloudy day). It stabilizes your image and is a very powerful feature. Set it to ON, except when shooting on a tripod. Sets SteadyShot when shooting movies. Intelligent Active: Provides the most powerful SteadyShot effect. I set it to this. Active (default setting): Provides a more powerful SteadyShot effect. Standard: Reduces camera shake under stable movie shooting conditions. You can choose between Standard and Adobe (extended color range)RGB. If you don’t know what this means, leave it to standard. Sets whether to adjust the shutter speed automatically during video recording in case if the subject is dark/ Set to ON. You can switch off audio recording in movie mode. You can select the microphone level for movie recording to Normal (for dialogue) or Low (for concerts etc). Sets whether or not to reduce wind noise during movie recording. Allows you to shoot an image after recalling often-used modes or camera settings registered in advance. Set the mode dial to MR (Memory recall). You can also recall registered modes or settings by selecting MENU → (Camera Settings) → Memory recall. Allows you to register up to 3 often-used modes or product settings in the product. You can recall the settings using just the mode dial. 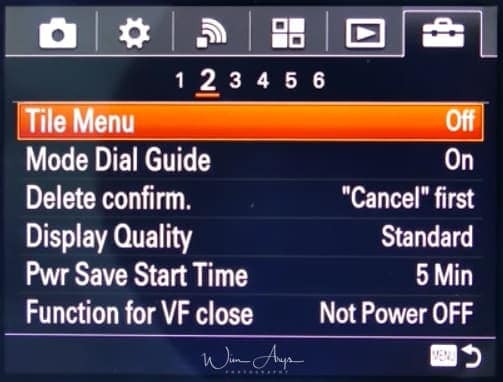 To recall registered settings: Set the mode dial to MR, then press the right/left side of the control wheel or turn the control wheel to select the desired memory number. To change registered settings: Change the setting to the desired one and re-register the setting to the same mode number. The zebra function shows a zebra pattern on the screen while shooting in any area that is in danger of highlight clipping. 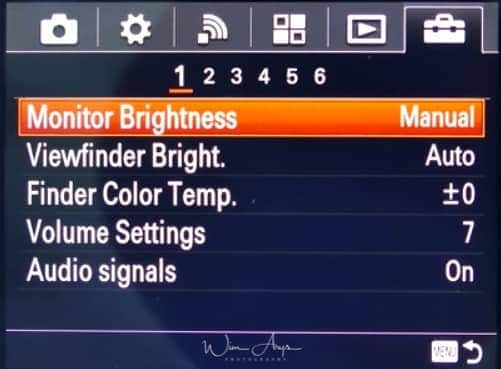 You can switch this OFF or anywhere in a range between 70 and 100.The Zebra Pattern is a highlight warning indicator that is common in video cameras. It does not control exposure but just warns you that your highlights are blown out. It is not recorded into the resulting image.I have it set halfway at around 75, and it is a very useful indication of correct exposure of the full picture. As I capture in RAW, I am very careful not to have any highlight clipping, to be able to recover highlights in Lightroom possibly entirely. This works in conjunction with the Focus Magnifier on Page 5 of the camera settings. You might remember that you can select the area to magnify there when using manual focus (MF). 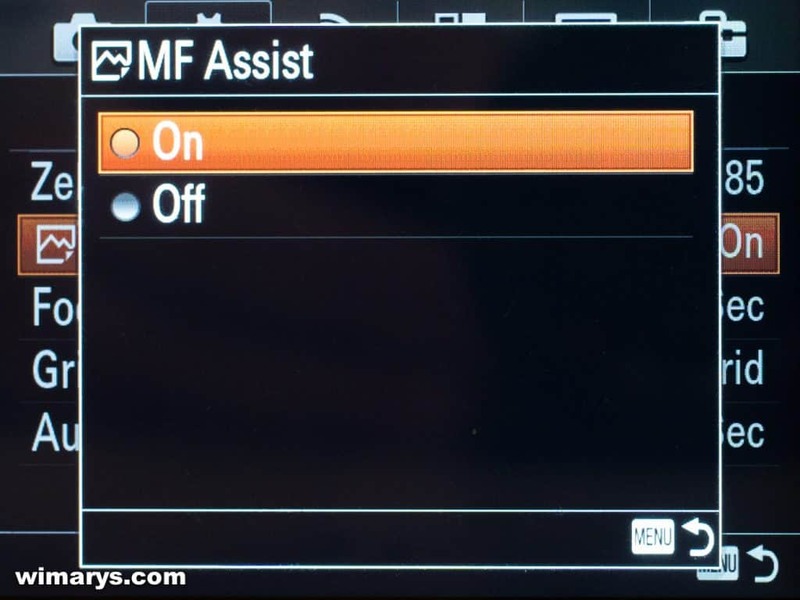 MF assist will need to be turned on if you want to use this feature. You can set how long to hold the magnified area during MF assist. 2 sec, 5 seconds or no limit. 2 seconds is how I have it set up. 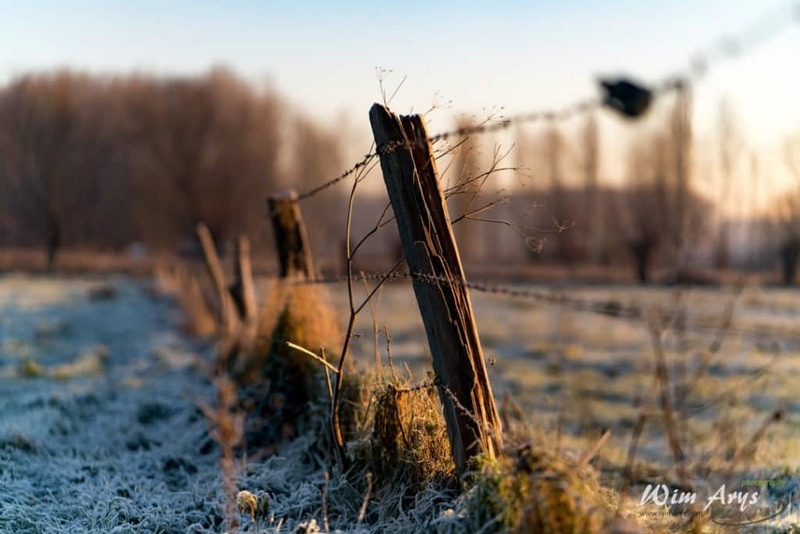 Having a grid line on your screen is a helpful aide for the composition of your image. The human brain is hard-wired to recognize the structure, and most people find a well-composed image more eye-pleasing. During photography history, rules have been developed on how to compose the different elements best within a scene. Many landscapes you’ll see have the horizon run through the middle of the image for instance, but this is just composition in its simplest form. Many photographers with a thorough understanding of these techniques go far beyond that. A good starting point is using the in-camera grid to make your brain aware of the possibilities in composition. The Rules of 3rds, Square and Diag +square are available in the Sony Alpha ILCE-5100. Sets whether or not to display markers set using [ Marker Settings] on the monitor while shooting movies. Sets the markers to be displayed while shooting movies. You can display all the markers at the same time. Select the amount of time the camera displays your image directly after capturing the image. 10, 5 and 2 sec is available, or you can turn this feature OFF if it annoys you. 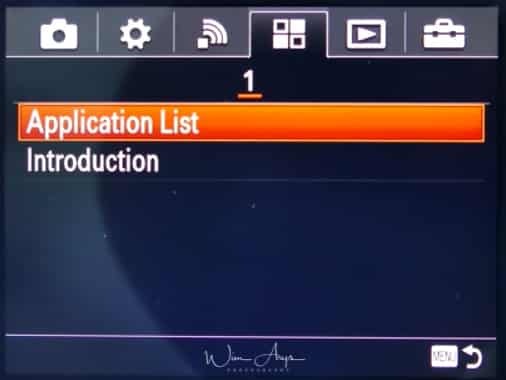 Selects the functionality (what is shown) on the screen when you press the DISP button (on the control wheel). You can choose Graphic Display, all info; no dips info and histogram. Peaking Level is a manual focusing aid that works when you have your camera set to MF or DMF. You’ll see a type of noise outlining the parts of your image where the focus lies; you can adjust the sensitivity to high, mid or low. Which setting is best depends on what lens you use, as with a sharper lens it can be configured to low, while more soft lenses benefit from a medium or high setting to clearly visualize what you’re focusing on. You can choose the color of this Peaking between Red, white and yellow. I have it set to red, as this contrasts nicely with most scenes you capture. 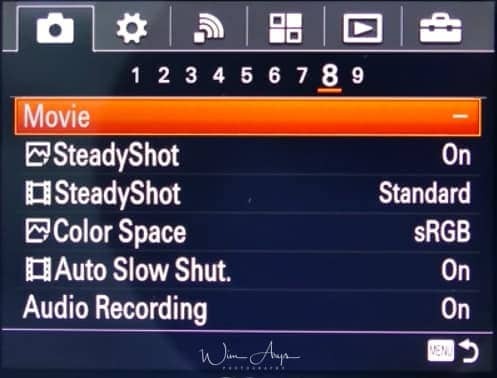 Sets the guide displayed when exposure settings are changed in the shooting screen. Excellent tool when you’re getting to know the functionality of your new camera. If you’re familiar with Sony’s feature, turn it OFF. Live view display allows you to see the image you’re going to capture with the settings you have dialed in like aperture and shutter speed. 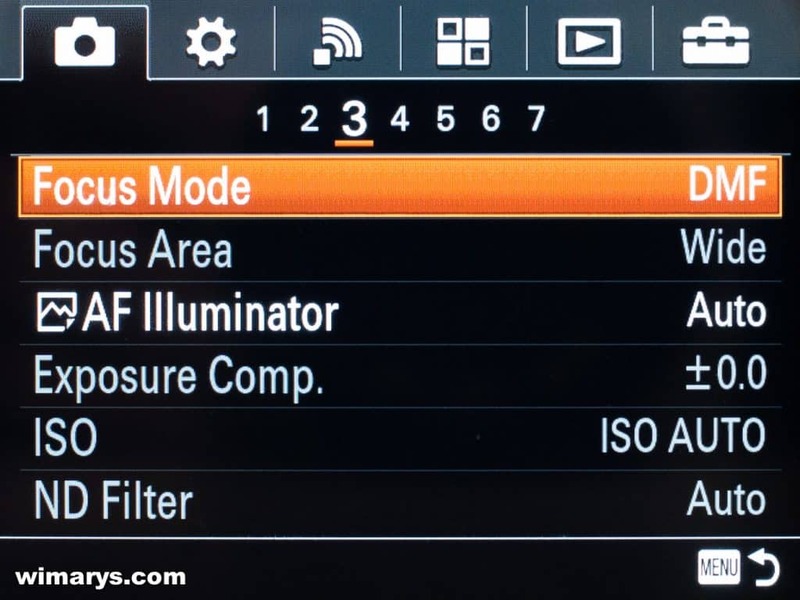 Some users report easier auto-focussing in low-light when it’s turned OFF, and you’d need to turn it off when using external flashes too that can’t be used with Sony’s TTL (through the lens) functionality. 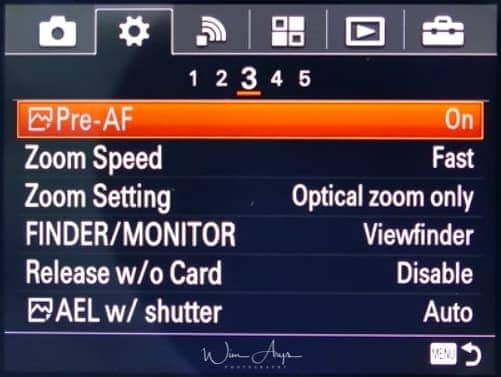 When pre-AF is set to ON, the camera will continuously focus, even without half-pressing the shutter button. This can be draining to the battery, especially when using some lenses like the Zeiss Touit range. Set it to OFF. Many People prefer to set Pre-AF off. This to prevent the camera from constantly trying to acquire focus without pressing the shutter button. It also saves battery life. Sets the zoom speed of the camera’s zoom lever. The Zoom Speed settings are also used when you are zooming with a remote controller. Normal: Sets the zoom speed of the zoom lever to normal. Fast: Sets the zoom speed of the zoom lever to fast. Set to Optical zoom only, using the optical zoom capabilities of your lens. If you set this to digital zoom, the camera will be basically cropping pixels out. Sets the method for switching the display between Electronic Viewfinder and the screen. 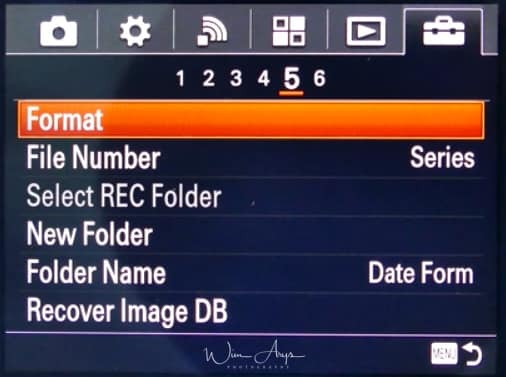 Auto (default setting): When you look into the Electronic Viewfinder, the display is switched to the Electronic Viewfinder automatically. Viewfinder: Switch between the Electronic Viewfinder display and the screen display by pushing up/down the pop-up finder. 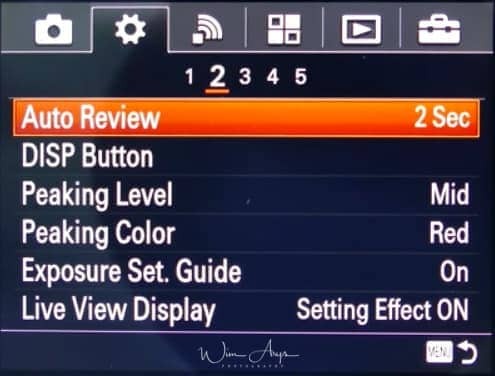 When the Electronic Viewfinder is pushed down, the image is displayed only on the screen. When the Electronic Viewfinder is pushed up, the screen is turned off and the image is displayed only in the Electronic Viewfinder. Basically telling the camera not to engage the shutter when you don’t have a memory card inserted. Set to on. Selects whether to fix exposure automatically when you press the shutter button halfway down. Leave ON. 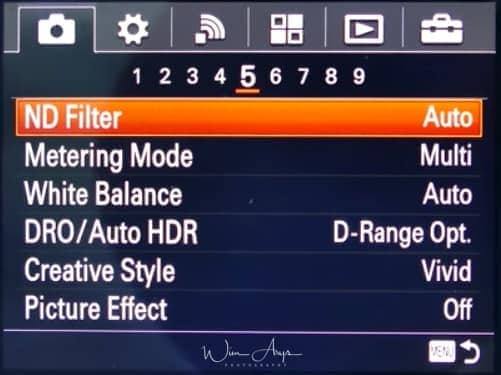 Auto (default setting): Fixes the exposure after adjusting the focus automatically when you press the shutter button halfway down when [Focus Mode] is set to [Single-shot AF]. 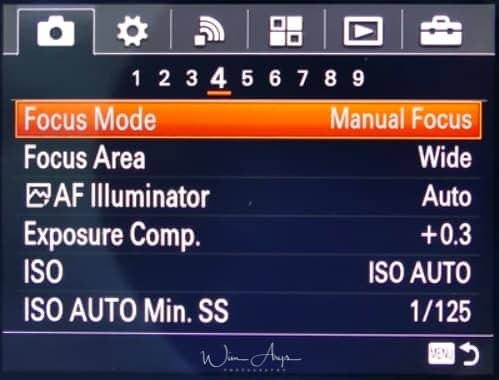 When [Focus Mode] is set to [Automatic AF], and the product determines that the subject is moving, or you shoot burst images, the fixed exposure is canceled. On: Fixes the exposure when you press the shutter button halfway down. Off: Does not fix the exposure when you press the shutter button halfway down. Use this mode when you want to adjust focus and exposure separately. You can set whether to shoot with a mechanical shutter or an electronic shutter. 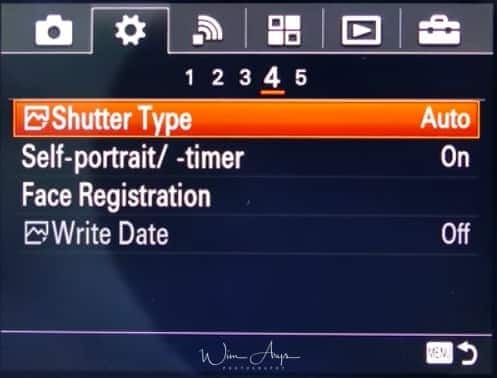 Auto: The shutter type will automatically switch based on the shooting conditions and shutter speed. You can change the angle of the LCD screen and shoot images while monitoring the image on the screen. Tilt the LCD screen 180° upward, and then point the lens at yourself. Press the shutter button. The product starts the self-timer shooting after three seconds. 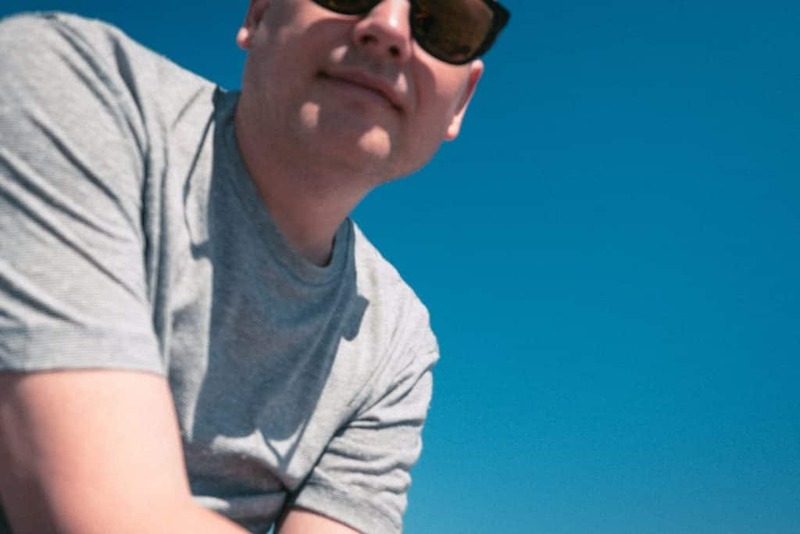 Hint If you want to use another Drive Mode than the 3-second self-timer mode, first set [Selfportrait/ -timer] to [Off], then tilt the monitor upward approx. 180 degrees. Hint If you want to use another Drive Mode than the 3-second self-timer mode, first set Self-portrait/ -timer to Off, then tilt the monitor upward approx. 180 degrees. This is where you can register faces; it works only when face recognition is set to ON (registered faces). 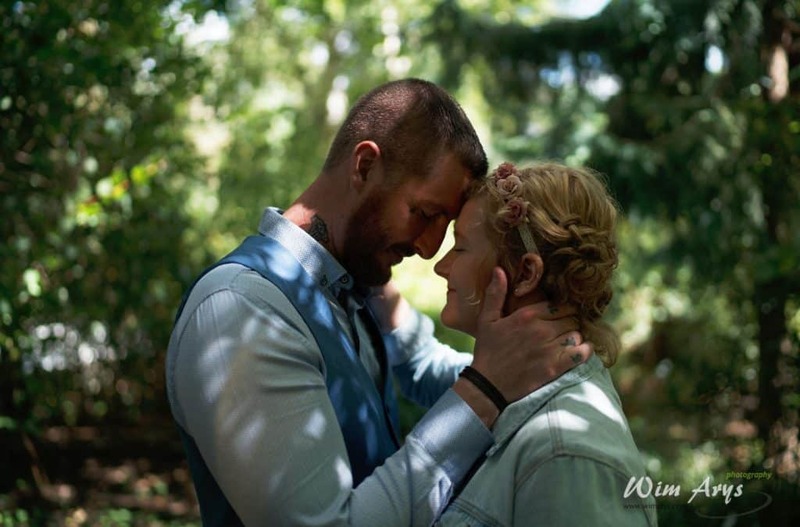 This is an interesting functionality, as you can register faces of your subject (like at a wedding the bride and groom) and the camera will automatically detect these registered faces and give autofocus priority to them. You can register up to 8 faces (by taking a picture of them within this menu) and set a priority order. Works well, and helps to get the right people in-focus in busy shots. You can assign the functions to be called up when you press the Fn (Function) button. Assigning functions to the various keys allows you to speed up operations by pressing the appropriate key when the shooting information screen is displayed. Sets the zoom functions when using the control ring to change zoom scales. The settings for Zoom Func. on Ring are valid only when auto-focusing. Standard (default setting): Zooms in/out smoothly when you operate the zoom by turning the control ring. Step: Zooms in/out at certain angle steps when you operate the zoom by turning the control ring. Sets whether or not to activate the MOVIE button. Always (default setting): Starts movie recording when you press the MOVIE button in any mode. Movie Mode Only: Starts movie recording when you press the MOVIE button only if the shooting mode is set to Movie mode. You can set whether the wheel will be locked by pressing and holding the Fn (Function) button. You can send one or several images directly to your wireless device (phone or tablet) by pressing this button. You can either decide to choose which images you want to transfer on the camera or on the wireless device (via the Sony PlayMemories app, available for free in the apple or android store). You’ll have to connect the camera via Wifi first (it makes a Wifi access point), using the instruction on the Sony RX100 IV screen. It works just like connecting to any other access point with your phone or tablet. You should do this as quickly as possible, just to get it out of the way. When your phone has wirelessly connected to the camera once, and you’ve entered the password, it will remember this, and make it a lot faster to connect later. You’ll need to physically connect the computer to the camera using the supplied USB cable, and you can push selected pictures to your Sony PlayMemories desktop software (installed from the CD or downloaded from their website). This can even be set up to continue pushing images after the camera has turned off. If you have a Wifi-enabled TV, you can view images and slideshows directly from your camera through your home wireless network. Enables Quick, one-touch connection (as opposed to first accessing the camera’s wireless network and then navigating to the Playmemories app) with NFC (near-field communication) capable devices. I have not tried this (as my iPhone does not have NFC) but it looks a lot easier to use. Disables all wireless functionality, just like airplane mode does on your phone. 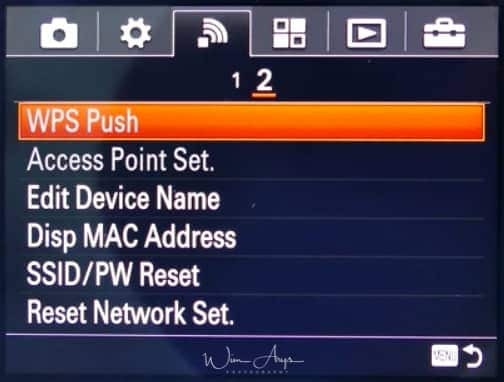 If your access point has the WPS button, you can register the access point to the camera easily by pushing the WPS button. Here you can setup an access point for your camera to the internet. It enables the Sony RX100 II to install PlayMemories apps from the internet directly. Works just like setting an access point (WiFi connection) on your phone. If you wish, you can change the name of the Device Access point perhaps to make it easier to identify which A6000 is yours in certain situations. Displays the MAC address of your Sony RX100M3. The RX100 III shares the connection information for Send to Smartphone and Smart Remote Embedded with a device that has permission to connect. If you want to change the device that is permitted to connect, reset the connection information. You’ll find The Smart remote control camera app (wich allows you to use your phone as a remote control via PlayMemories phone app for iPhone and Android) and the Playmemories Camera app here. You can access your online PlayMemories account here, or create an account (once you’ve set up your camera connection with your Wifi network). You’ll also be able to download new apps available for purchase in the Sony Playmemories online app store like the Time-lapse and smooth reflection app. If you do not want to connect your camera to the internet, you can always install new apps (and updates) if you connect the camera to your Mac or PC with the supplied USB cable, using the Sony PlayMemories desktop application. Delete on or multiple images stored on your SD card. select how the camera will arrange captured images in the viewing browser. Select whether you want the image browser to display 12 (larger) or 30 (smaller) images per page. Select whether you want the camera to automatically rotate images when you rotate the camera or not. Select whether you want the camera to repeat slideshows when all pictures are viewed or not, and choose the interval between slides. Change the orientation of images in-camera. Select an image and enlarge a portion of that image. Useful for checking details and focus. Outputs still images in 4K resolution to an HDMI-connected TV that supports 4K. Protect images (selectable or per date) from accidentally being erased. Change the interval of the image tracking of the subject’s motion in high-speed, like a stroboscopic image. Allows you to apply the Beauty Effect to retouch the still image of a person and make it look better, for example, by retouching it for smoother skin, larger eyes, and whiter teeth. You can set the effects from level 1 to level 5. An image on which the Beauty Effect is used is saved as a new file. The original image is retained as it is. Skin Toning: Adjusts the skin color as you like. Skin Smoothing: Removes age spots and wrinkles from the skin. Shine Removal: Reduces the look of oily skin. Adjusts the skin color as you like. Eye Widening: Enlarges the eyes of the subject. Teeth Whitening: Whiten the teeth of the subject. To use two or more effects with Beauty Effect one after another, first apply an effect to the image, then select another effect using. Manually set the Monitor brightness (recommended leave to zero) or change to a brighter setting for Sunny Weather. When using an electronic viewfinder, you can adjust the brightness of the electronic viewfinder according to the surrounding environment. Leave it on Auto. Adjusts the color temperature (-2 +2) of the electronic viewfinder. Change the playback volume for recorded video or demos. You can turn off audio signals like the beep when te camera achieves focus. Useful if you want a more stealthy operation (although you’ll still hear the second curtain shutter). 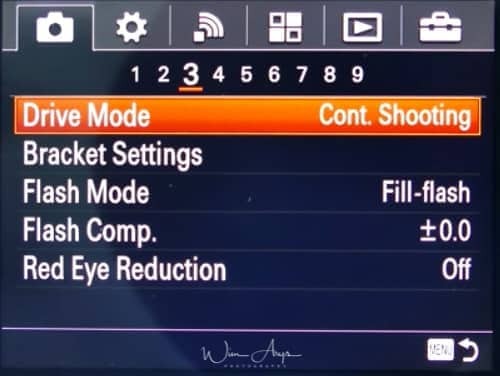 You can display the description of a shooting mode when you turn the mode dial and change the settings available for that shooting mode. Handy when you are learning how to use the RX100 II. You can set whether Delete or Cancel is selected as the default setting on the delete confirmation screen. You can change the display quality. Set to standard to preserve battery life. High: Displays in high quality. Standard: Displays in standard quality. Selects the time it takes for the camera to go into sleep mode if you don’t use it. Sets whether to turn the power off when the viewfinder is stowed. This was not available in the Mark III, so everytime you pushed the EVF inside, the camera would turn OFF. Very annoying, good that this setting is here now. Plays back movies recorded with the product on a NTSC/PAL system TV. 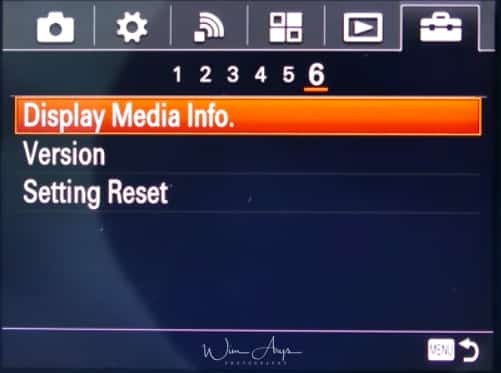 If you insert a memory card that has previously been formatted with a different video system, a message telling you that you must reformat the card will appear. If you want to record using another system, re-format the memory card or use another memory card. Demo mode is only used in retail stores for demonstration purposes. The time code (TC) and the user bit (UB) information can be recorded as data attached to movies. TC/UB Disp. Setting: Sets the display for the counter, time code, and user bit. TC Preset: Sets the time code. UB Preset: Sets the user bit. TC Format: Sets the recording method for the time code. TC Run: Sets the count up format for the time code. TC Make: Sets the recording format for the time code on the recording medium. UB Time Rec: Sets whether or not to record the time as a user bit. MENU → (Setup) → [TC/UB Settings] → [TC Preset], then press in the center of the control wheel. Set the other digits following the same procedure as in step 2, then press in the center of the control wheel. MENU → (Setup) → [TC/UB Settings] →[TC Preset], then press in the center of the control wheel. MENU → (Setup) → [TC/UB Settings] → [UB Preset], then press in the center of the control wheel. Turn the control wheel and select the first two digits. Press the (Delete) button to reset the user bit (00 00 00 00). MENU → (Setup) → [TC/UB Settings] → [TC Format], then press in the center of the control wheel. DF: Records the time code in Drop Frame format. NDF: Records the time code in Non-Drop Frame format. MENU → (Setup) → [TC/UB Settings] → [TC Run], then press in the center of the control wheel. Rec Run: Sets the stepping mode for the time code to advance only while recording. The time code is recorded sequentially from the last time code of the previous recording. Free Run: Sets the stepping mode for the time code to advance anytime, regardless of the camera operation. MENU → (Setup) → [TC/UB Settings] → [TC Make], then press in the center of the control wheel. Preset: Records the newly set time code on the recording medium. Regenerate: Reads the last time code for the previous recording from the recording medium and records the new time code consecutively from the last time code. The time code advances in [Rec Run] mode regardless of the [TC Run] setting. 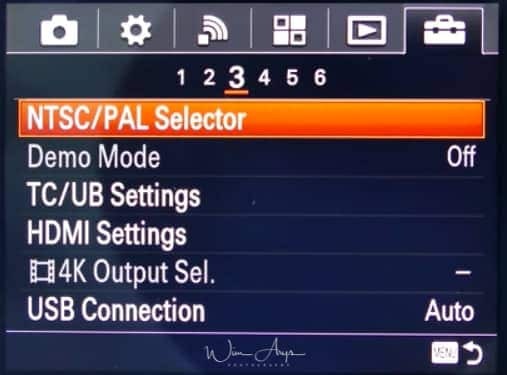 HDMI Resolution: When you connect the product to a High Definition TV with HDMI terminals using an HDMI cable, you can select HDMI Resolution to output images to the TV. Auto, 1080p and 1080i are available. 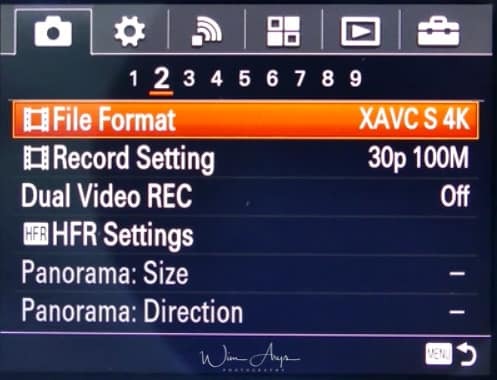 CTRL FOR HDMI: When connecting the Sony RX100 IV to a “BRAVIA" Sync-compatible TV using an HDMI cable, you can operate this product by aiming the TV remote control at the TV. Turn it ON if you want to use it. HDMI Info. Display: Selects whether to display the shooting information when this product and the TV are connected using an HDMI cable. 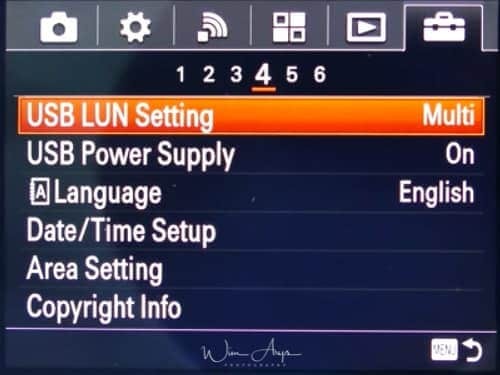 You can set how to record movies and perform HDMI output when your camera is connected to external recording/playback devices, etc. Memory Card+HDMI: Simultaneously outputs to the external recording/playback device and records on the camera’s memory card. HDMI Only(30p): Outputs a 4K movie in 30p to the external recording/playback device without recording on the camera’s memory card. HDMI Only(24p): Outputs a 4K movie in 24p to the external recording/playback device without recording on the camera’s memory card. HDMI Only(25p): Outputs a 4K movie in 25p to the external recording/playback device without recording on the camera’s memory card. Selects what will happen when you connect your camera to your PC or MAC. Auto (default setting): Establishes a Mass Storage or MTP connection automatically, depending on the computer or other USB devices to be connected. Windows 7 or Windows 8 computers are connected in MTP, and their unique functions are enabled for use. Mass Storage: Establishes a Mass Storage connection between this product, a computer, and other USB devices. MTP: Establishes an MTP connection between this product, a computer, and other USB devices. Windows 7 or Windows 8 computers are connected in MTP, and their unique functions are enabled for use. Improves compatibility with external devices by limiting the functions of the USB connection. Older devices that are not able to connect to the camera might work when set to single. Otherwise, use Multi. You can charge the Sony RX100 II via USB. This setting sets whether to supply power via the micro USB cable when the product is connected to a computer or an USB device. Set your preferred language. The advantage of setting it to Eglish is that you’ll find much more information online when you need any troubleshooting. Change date, time, date format and Daylight savings time. Select your region, or change region when abroad, the camera will automatically change time and date for you. You should always insert your credentials here. Your copyright will be written to the image file. Format your SD card before use; this will erase any images still on the memory card. Choose whether to have folder names in standard form (DSC) or create a new one by date. Setting folders by date will make organizing your images easier. If you have a storage card error, you can try to rebuild the database to possibly retrieve lost images. Displays the recordable time of movies and the number of recordable still images for the inserted memory card. Check what version of the operating system your camera and lens are running. Sony sporadically releases updates with new features, so it might be worth checking if any new firmware versions are available. Fully resets the camera to factory settings. Mode dial functions: what’s the difference between intelligent and superior auto? This mode lets the camera detect what kind of scene you are photographing. It switches to the scene setting it finds most appropriate, including aperture, shutter speed, ISO, and AF mode. These different scene settings are the same you’ll find manually selectable in SCN mode. All Sony cameras do a good job at detecting scenes, although the advanced photographer will prefer to shoot in Aperture, Shutter priority or fully manual mode in order to have more control over things like depth-of-field, movement, and focusing area. Does the same scene recognition and (when the camera decides it is appropriate) adds hand-held twilight, anti-motion blur, and backlight correction HDR in order to optimize dynamic range, movement and exposure. This is only for jpeg shooters, as it uses multiple images shot in close succession at high quality and combines them into one jpeg. Works well on stills but should not be used for movement. Zebra will show zebra pattern lines on blown highlights. The clipping detection threshold is selectable from 70 to 100+. Lower values indicate possible highlight clipping sooner than higher. Setting it somewhere around 90 will give you a good indication of whether you’re in danger of unrecoverable clipping without having the screen cluttered with stripes all the time. 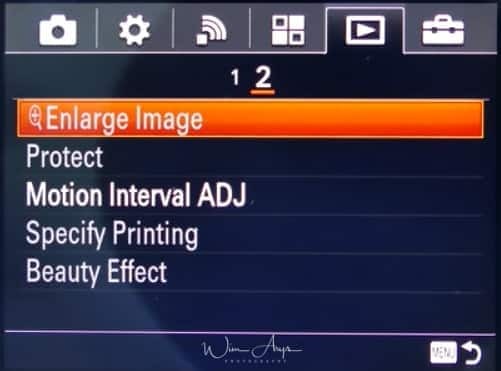 When set to ON, Magnification will automatically magnify a selectable (through the menu) part of you image when in Manual Focus Mode (MF). MENU → (Custom Settings) → [ MF Assist] → [On]. You can check the focus by enlarging the image before shooting. MENU → (Camera Settings) → [Focus Magnifier]. Press on the center of the control wheel to enlarge the image and select the position you want to enlarge using up/down/left/right side of the control wheel. MENU → (Custom Settings) → [Peaking Level] → desired setting. It displays a color selectable noise in the regions where the focus is on. A low setting is recommended in enough light on the Sony RX100 IV. In dim light, you might need to go to medium to get a good idea of where the focus is at. Depending on the options selected in [Focus Area] or [Center Lock-on AF], the available functions varies when pressing the key. When you press the key when the [Focus Area] is set to [Wide] or [Center] and [Center Lock-on AF] is [On], [Center Lock-on AF] will activate. 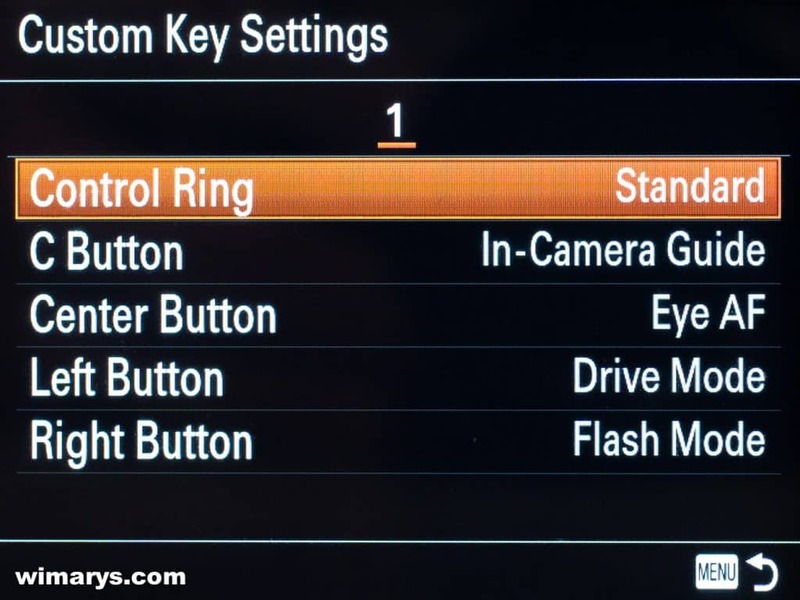 The camera will automatically focus while pressing the key when the [Focus Area] is [Wide] or [Center], [Focus Mode] is set to other than [Manual Focus], and [Center Lock on AF] is set to [Off]. When you press the center button, the camera detects the subject positioned in the center of the screen and continues to track the subject. Align the target frame (A) over the subject and press in the center of the control wheel. Press again to stop tracking. If the camera loses track of the subject, it can detect when the subject reappears on the monitor and resume tracking. When set to On, The Sony RX100 IV will automatically detect and focus on faces. This is a very powerful feature and can even be made faster by registering faces beforehand. You can even prioritize any of the 8 registered faces according to importance. Ideal for a wedding or family reunion when you know the persons who you are going to photograph. On (Regist. Faces): Detects the registered face with higher priority using Face Registration. On: Detects a face without giving higher priority to the registered face. MENU → (Custom Settings) → [Face Registration] → [New Registration]. Align the guide frame with the face to be registered, and press the shutter button. When a confirmation message appears, select [Enter]. Eye AF is great for portraiture and large apertures. With a shallow depth of field, it is at times difficult to get the appearance of a well-focussed face. The AF system could wonder to an ear or a chin when you finally get that exact shot that you’re looking for. Eye EF eliminates this problem by detecting your subject’s eyes and placing the focus point there. It tracks them too. You’ll need to assign a button of your choice in order to make this work. MENU → (Custom Settings) → [Custom Key Settings] → assign the [Eye AF] function to the desired button. Point the camera at a person’s face, and press the button to which you have assigned the [Eye AF] function. Press the shutter button while pressing the button. When contrast between the subject and background is high, meter the light at a spot where the subject appears to have the appropriate brightness and shut the exposure before shooting. You’ll need to assign a button to this function to do this in Menu – Custom Settings – Custom Key Setting and then assign the AEL toggle to the desired key. exposure will be locked, and AE lock lights up. Focus on your subject and press the shutter button. To cancel the exposure lock, press the button to which the AEL toggle function is assigned. you are holding down the AEL button. The RX100 IV has a 3 EV-stop ND filter. This is sufficient to enable you to get that smooth waterfall or flowing river picture. You can easily access it through the Fn button Menu. 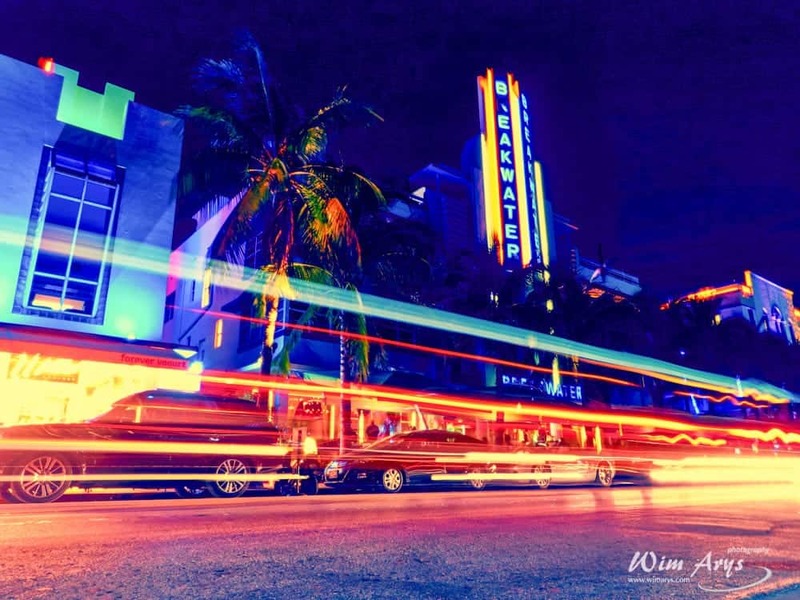 Bulb mode is great for shooting trails of light, such as fireworks, car lights, etc. It’s best to use a remote or the Sony Playmemories remote app (that is downloadable for free) as you want to eliminate movement. 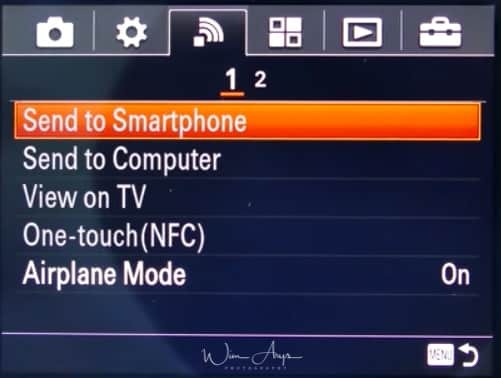 Firstly set the mode dial to M.
Connect your phone to the camera using WiFi or NFC. Dial exposure time to Bulb on the app. Dial in a suitable Aperture value from F/5.6. Press the shutter button on the app to start the exposure. Press the shutter button again on the app to stop the exposure. The Sony RX100 IV brought many new software innovations to the RX line. Besides the ability to record in 4K and make High Frame rate movies, you shouldn’t overlook the many new focusing aides inside the camera like Eye AF and focus peaking. If you have any questions, I’d love to hear from you in the comment section below. Hi Bruno, maybe you’ll get away with an A4 print, but I would not go larger. Do the same tips apply to RX100 III too? Hi Nikos, yes most of them will. Nice post. I’m trying to get more out of this fancy little point and shoot, for both video and stills. Any chance that function and control ring custom settings can be made dependent on mode dial adjustment? For example, I could switch to M on mode dial I would be able to adjust those settings I use for stills, then switch to ‘movie mode’ on the mode dial and adjust those settings I use for video? Seems like this would be necessary for such a loaded menu system. Hi Sam, I’m actually not sure, and can’t try it out because I don’t own this camera anymore. Hey Wim while you might not be a cave diver. I just got this camera to do video underwater and in a cave. I was wondering what settings you would do for such videos? Hi Matt, set white balance to underwater and leave it on auto. I haven’t done any underwater cave videos but have done a few underwater model shoots and this works well. I would invest in an underwater video light if I was you, you’re going to need it to keep ISO (and noise) low. I think your Tipsand tricks for the Sony RX100are really informative. I’ve had my Sony RX100 MkIV for some months now and really love it. I just have one little querie, is it possible to switch off the full magnification when examining taken jpgs?